Today's card was inspired by a tutorial May Park provided for the Online Card Classes "Making Merry" class. I am never able to follow the classes "live" due to work, so I catch it when I can and this project really inspired me for this tone on tone birthday card. 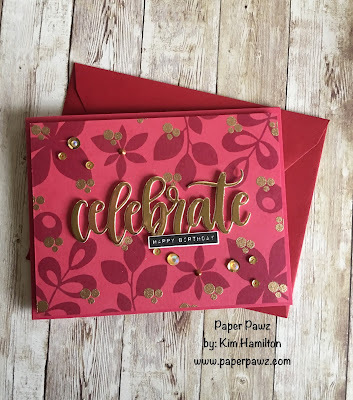 I started by picking the Lawn Fawn Raspberry card stock for my panel and card base. I simply love Lawn Fawn card stock, by far my favourite and this colour makes me smile! I then decided to pull out some old Paper Smooches stamps that I had in my stash for the leafy/floral background. For the ink colour I chose the Hero Arts Raspberry Jam dye ink. I placed my stamps using my Misti stamped one side then flipped my panel and stamped the second side. From one of the same stamp sets I took the "berries" or three dots and stamped them using clear embossing ink and added gold embossing powder. I then die cut the MFT Celebrate die with gold mirror paper (with fun foam and StickIt for dimension). I stamped the Happy Birthday sentiment from the Mama Elephant set that was a free gift with purchase during their 5-year birthday sale in VersaFine Onyx Black Ink. Popped the strip up with some foam tape. I finished the project with a scattering of gold Pretty Pink Posh sequins. Thanks for taking the time and have a great weekend!